Looking for Salt Lake City Home Inspector You Can Trust? Aren’t Home Inspections All Created Equal? Believe it or not, many home inspections are little more than an educated opinion about a home’s condition. What happens when an inspector overlooks something? Or gives a passing grade when a potential problem exists? All too often, those unexpected repairs come out of the new homeowner’s pocket… even though the purpose of hiring an inspector is to prevent this situation. My name is Dennis Fisherand I’m a licensed and certified Salt Lake City and surounding area home inspector who believes that inspectors should be accountable for the inspections they perform. That’s why every inspection I conduct is backed by our “If we pass it, we protect it” guarantee, meaning unreported repairs come out of our pocket… not yours! In fact, our inspections, reports, and findings are guaranteed. It’s a level of security that no other home inspection company in Salt Lake City or the surrounding areas can match, all for one very affordable price. 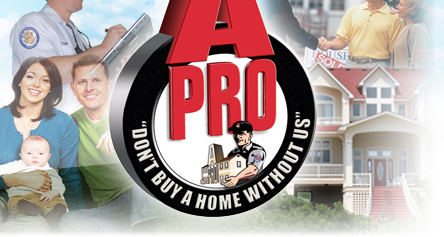 Call Dennis now at 1-801-210-8220 for a FREE no-pressure consultation and experience just how different A-Pro really is. This entry was posted on Saturday, July 31st, 2010 at 1:18 pm	and is filed under Top Salt Lake City Real Estate Agents. You can follow any responses to this entry through the RSS 2.0 feed. Both comments and pings are currently closed.